We can’t believe it is that time of year again, time for PCBC, the Pacific Coast Building Conference, where we have been exhibiting since our arrival on US soil. The arrival of this event, seemingly so soon, has given us a bit of pause to reflect on our experience in this market. Over the last 5 years we have completed installations from coast to coast that include everything from super high end custom residential to retail, office, student housing, and others. Looking forward we expect to deliver projects that include the Global Headquarters of a Fortune 50 company, several 5 star hotels, meditation centers, a monastery, seniors housing, and many other product types. Up and down the architecture spectrum, the AEC community has found that Messana’s radiant cooling and heating ceiling panels deliver the optimum thermal environment for their clients. Coupled with extremely handsome and knowledgeable salespeople, this reality has contributed to our extraordinary success! Please, with our compliments, join us in our booth #211 at PCBC 2016 conference in San Francisco to celebrate our accomplishments, and add your next project to the list that we will be celebrating this time next year. 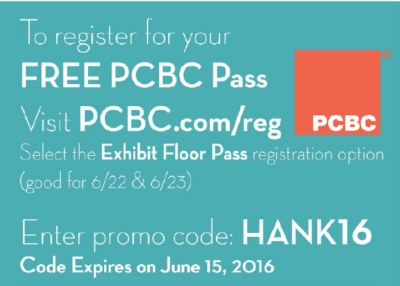 For two free days of PCBC 2016 exhibits on June 22 and 23, simply visit PCBC.com/reg, select the registration option and enter the promo code: HANK16. Thanks so much, and we look forward to seeing you there! PS – If you can’t make it to PCBC 2016, but want to learn more, just reply to this email or give Dan a buzz at (510) 710-1907. For more details, visit www.pcbc.com.